Blokfest has a suggested lowest age limit for junior categories of 8 years old. This is just a guide due to the nature of problems that are set for the age range 8-16 and therefore the sizes/height issues associated. The Blokfest team will try their best to set blocs that work for as many people as possible. To make these immense events possible there is no other way but to charge an entry fee. 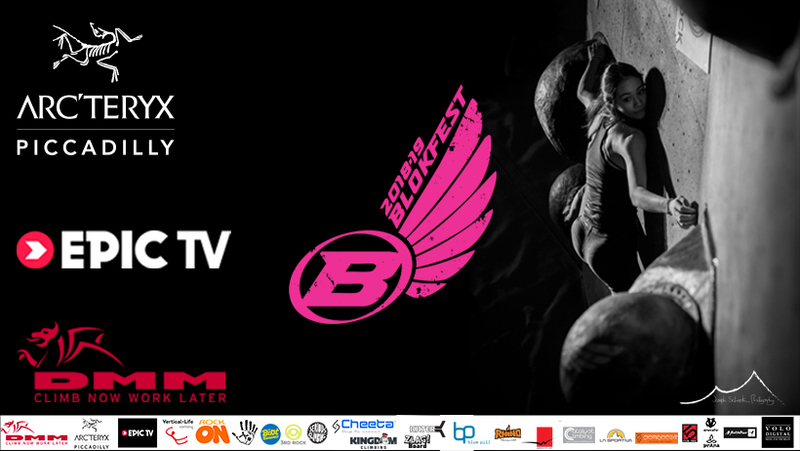 You will not need to pay a climbing wall entry fee to take part in Blokfest - the fee covers your cost to climb within the parameters of the Blokfest event at the host center on that day. The entry fee goes towards the expense of the host venues and the huge amount of Blokfest organisation and supplies. Your entry fee also gets you a unique Blokfest t-shirt or vest which is given to each season participant. All entry is via online tickets only. See Events and Tickets page. Spectating - If non Blokfest participant or supervisor a suggested £5 donation to help make the finals possible would be very welcome. 1 point for every zone hold secured (zone point is automatically added if you top the problem). Each individual festival score goes towards an overall series league table of which the overall winner will win a handmade Blokfest trophy and fame and glory amongst their peers and the Blokfest ambassadors. Cheating – anyone who is suspected of or found cheating will be publically humiliated in front of the entire crowd and embarrassed everyday for the rest of their lives! Bouldering shall take place on short climbing routes, called boulders, climbed without ropes, constructed on purpose-designed, artificial climbing walls. A Final event with a course of 3 boulders for each Category. Optionally, marked footholds for one or both feet. A defined standing position on top of the boulder. Where the start includes marked footholds, with a foot on one of these footholds. If a participant cannot reach the starting holds from the ground, they shall be permitted to start the boulder by jumping for the starting holds. Every part of the participant’s body has left the ground. A completed boulder will be awarded if the participant controls with both hands the marked finish hold. Controlled the marked finishing hold of the Boulder with both hands within any fixed time period defined for the climber’s attempts. Participants may not make additional scoring attempts after the end of the round on their scorecard. In the event that the final quota is exceeded because of tied competitors, the number of tops achieved by these tied participants will be used to break the tie. i.e. If 2 competitors are tied in 5th place on a score of 217 where one competitor has 24 tops and the other 22, the competitor with the greater number of tops will advance to the final. The zone point will be awarded also where a competitor successfully completes the boulder without having controlled the zone Hold. An electronic timing system shall be used in each round to display the climbing time remaining for each competitor’s attempts. The quota of competitors qualifying Male Senior and Female Senior for the Final round shall be 5 competitors. Once the closing time for the Isolation Zone has passed, Competitors must remain within the Isolation Zone unless otherwise instructed. The Isolation Zone closing time for any round of the competition shall not be earlier than one (1) hour before the competitor first on the starting list is scheduled to commence climbing or in the case of the final round, the time scheduled for the presentation of the finalists. Competitors shall have no knowledge of the boulders other than that obtained during the official observation period or that communicated to them by the Head route setter or the judges. It is the sole responsibility of each competitor to fully inform themselves with respect to all instructions regarding the boulders. For the avoidance of doubt whilst in the Competition Area, competitors are not permitted to seek any information from persons outside the Competition Area, unless specifically authorised to do so by the Blokfest team. Competitors who have completed their attempt(s) on a boulder and who for any reason remain in the Competition Area must not pass any information concerning that boulder to any competitor who has not yet attempted that route/boulder. While in the observation area, all competitors remain under the Isolation Rules. Competitors shall remain within the designated observation zone during the observation. They are not permitted to climb on the climbing wall or stand on any equipment or furniture. They may seek clarification only from the Blocfest team, or the Boulder Judge assigned to the boulder. During the observation period, competitors are allowed to touch only the marked starting holds, without leaving the ground with both their feet. No recording equipment shall be permitted. Competitors will be allowed a 1 minute observation of each of the finals boulders in the order that they will be climbed. The Boulder Judge or organising staff shall clean all holds on a boulder before each competitor begins their first attempt. A competitor may also request that holds be cleaned before any attempt on the boulder. Competitors may clean holds that they can reach from the ground. Only brushes or other materials that are provided by the organisation shall be used for this purpose. The Final round shall take place on one course of boulders for each Category. Both Categories shall normally compete simultaneously, with the first competitors from each Category starting their attempts on each boulder at the same time. The Final round shall be preceded by a presentation of the competitors eligible to participate in the round. Once a competitor has finished their attempts, they shall return to a separate isolation area and the next competitor shall start their climbing period immediately; Once all competitors have completed their attempts, the competitors shall move on to the next boulder as a group; The climbing period during the Final round shall be 3 minutes for each competitor. However, if a competitor begins an attempt prior to the end of the climbing period, they shall be allowed to finish that attempt. Both Categories shall commence each boulder at the same time, i.e. if all competitors in one Category have completed their attempts on a boulder, that Category shall wait for the other before starting the next boulder. In the circumstances of tie competitors shall make one attempt on a “Tie-Break” boulder in the starting order of the Final round. If following these attempts two or more competitors remain tied, the relevant competitors shall make further attempts up to a maximum of six attempts following the same procedure until they are separated. If a tie still exists after six attempts, then the relevant competitors will be given an equal ranking. As of November 2017 we are stipulating that EpicTV have filming exclusivity for the each of the five events. Any filming by other parties during the event or during the preparations needs to be pre-agreed with Blokfest at all times. Facebook Live or similar Live streaming is strictly forbidden during the finals to protect the exclusivity and content rights of EpicTV. All stills photography during any part of the event needs to be pre-agreed within 5 days of the event start date. A maximum of two photographers will be allowed on the field of play (mats and cordoned off zone during the finals) and these two photographers will be arranged in advance. By submitting a registration form participants consent to images of them being used for promotion of Blokfest and the host climbing centre. As a participant official images on social media or other channels can be shared for “personal use”, non-profit or non-business related activities only. If you wish to use an image for business or promotional purposes (i.e. sponsors, events, climbing centres, coaching), or other advertising purposes you must gain consent from the photographer & Blokfest directly.